Garlic Goodness!! And What’s Next? 14 Jul Garlic Goodness!! And What’s Next? The garlic in my garden was ready this past weekend! The leaves had started to yellow from the bottom so I dug one up and decided it was time. In my mind, there is no easier crop than garlic. Garlic is planted in the late fall, sets roots and begins to grow in spring. In July it is ready and it is a joyful day when it is harvested. In very late fall I mulched the garlic beds with leaves. I mixed the leaves in a little this spring and top-dressed with a thin layer of compost. I watered with Neptune’s Harvest Fish and Seaweed and mulched with chopped straw. Every two to three weeks I watered again with Neptune’s Harvest. The bulbs swelled and grew. On Sunday I harvested them with my son Henry. I loosened the soil around the roots with a small shovel and he pulled them out. “Wow!” he exclaimed. “Look at the roots!” When you garden organically and nourish the SOIL, the soil feeds the roots and they grow long and strong and happy. They provide you with beautiful food. Row cover on my cucumber plant. Now that I have 2 empty beds, it is time to fill them with something else. In one bed I transplanted two yellow squash plants and in the other I transplanted corn we started from seed a few weeks back. 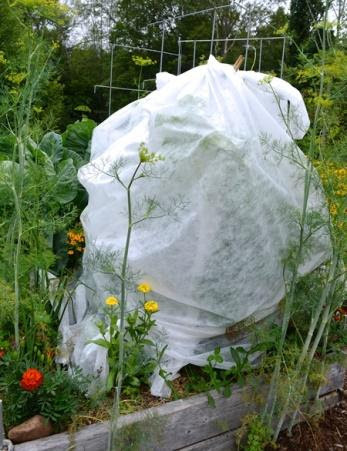 The squash I immediately covered with a row cover to keep off the many insects that feed on squash leaves and vines. 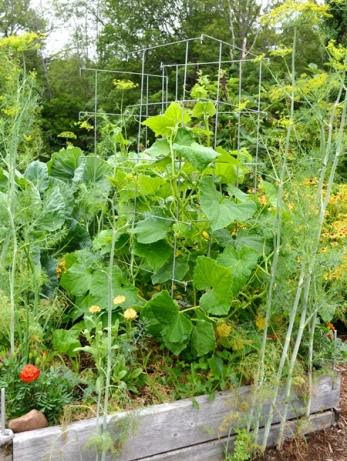 It will protect the plants by hiding them from these destructive insects like the squash vine borer, Mexican bean beetles and squash bugs. I use row covers on many of my crops. On Sunday, I took the row covers protecting my cucumber plants off. It’s time to allow the flowers to be pollinated now. The plants are now susceptible to the destructive bugs but I have kept them off for several weeks and given the plants a great head start! The cucumber plant is now ready to be pollinated – Shall I yell “Come and get it.”? We will again have seed garlic in September and October this year. Jillian will be giving another “how to grow garlic” workshop in September. Stay tuned for details! Remember to FEED your soil in your vegetable gardens this summer. Water the tomatoes, beans, squash, etc with a liquid organic fertilizer every few weeks. Scratch in some granular organic fertilizer around the plants as they grow. These will help with summer heat stress and provide the plant with much needed nutrients since it is growing so quickly and producing so much food for you. Back to the garlic…Your garlic may need another week or two to grow. Harvest when 2-4 leaves on the bottom begin to yellow. I waited too long last year and my garlic began to split open and did not store as well. You want to harvest it before that happens. Dig one up, check it out to see how it is growing and use it for cooking this week! Send us your garlic recipes-I am looking for some!